February 16, 2008 -- ILL 02/16/2008 (www.suburbanchicagonews.com) "New subpoena served"
"Before he was investigated by [Drew] Peterson, [Bindy] Rock was convicted of the April 1970 murder of Joliet police Det. William Loscheider. But it was actually a fellow officer who gunned down Loscheider during a burglary investigation at a North Broadway liquor warehouse, but courts blamed Rock because the death occurred while Rock was committing a crime. Rock, a reputed loan shark, was allegedly fleeing the scene with two accomplices when Loscheider was killed by friendly fire." "Detective Loscheider, along with other officers, was working on a stakeout of a liquor company in the 700 block of Broadway following information from an informant. After observing three men making entry into the business, officers were given orders to move in. The suspects quickly fled after spotting the officers, one of whom was apprehended immediately. A second officer was chasing the suspects when he lost sight of them. As Detective Loscheider approached the scene with his gun drawn in the darkness, the second officer did not recognize him. The officer ordered him to drop his gun. When Detective Loscheider didn't comply, the officer fired from his shotgun, fatally wounding him. The burglars were later apprehended, charged and convicted with murder for Detective Loscheider's death. Detective Loscheider is survived by his wife and daughter. Since his death, the Department organized the Police Athletic League and the field at Plainfield and Wyoming was dedicated in his memory. Detective Loscheider received 17 commendations, one of which was for rescuing a girl from a fire, for which he was most proud." 1970-04-02 2003 (wings.buffalo.edu) "PEOPLE of the State of Illinois, Plaintiff-Appellant, v. Glenn HICKMAN and Anthony Rock, Defendants"
"The factual situation which resulted in the trial of the defendants occurred on the evening of April 2, 1970, at which time seventeen policemen from the police force of the city of Joliet were participating in a surveillance of a building known as the Illinois Wine and Liquor Warehouse. Among the officers involved in the surveillance was Sergeant James Cronk, who shortly before 10:15 P.M. noticed Robert Bruce Papes and the defendant Anthony [Bindy] Rock pass by the warehouse several times in a Cadillac automobile. Later several officers saw a Chevrolet automobile enter an alley south of the warehouse and stop at a side door of the building. Several people left the automobile and disappeared from sight into the doorway. The driver of this vehicle, who was Papes, walked a short distance, made a surveillance of the area, returned to the automobile and then drove out of the sight of the officers. After several minutes Papes was again seen walking in the alley and after once more looking over the area he again disappeared from the sight of the police officers when he went to the location of the side doorway of the warehouse. It was within a matter of a few seconds of Papes' disappearance that Sergeant Cronk saw three individuals exit from the side doorway of the warehouse, at which time he signaled the officers to close in from various directions towards a concrete parking lot which was to the rear and west of the warehouse. Papes and the defendants Rock and [Glenn] Hickman upon seeing the officers approaching them proceeded to run. Papes ran in a southwesterly direction and the defendants Rock and Hickman in a northwesterly direction towards some bushes located at the northwest corner of the parking lot. Papes was apprehended when a Sergeant Erwin pointed a shotgun at him. Papes submitted to an arrest and upon his person was found a [p. 414] loaded pistol and additional cartridges. As the defendant Rock was running he was carrying a small object in his hand. The defendant Hickman was carrying an attache case as he was fleeing. The defendants Rock and Hickman ran through the bushes while in the meantime Sergeant Cronk ran to the rear of the warehouse where he noticed two people running in a northwesterly direction. Sergeant Cronk yelled 'halt--police' several times but his commands were ignored. He lost sight of the two fleeing individuals but within seconds thereafter saw a man carrying a handgun running towards the bushes at the northwest corner of the parking lot. Sergeant Cronk, believing that this approaching individual was one of the burglars of the Illinois Wine and Liquor Warehouse, and referring to the handgun, ordered the person to 'drop it.' When there was no compliance to this warning Sergeant Cronk fired his shotgun at the individual, who was later discovered to be Detective William Loscheider of the Joliet police force. Loscheider was killed by this shot from his fellow officer's gun. Approximately one-half hour later the defendants Rock and Hickman were arrested as they were walking on a street approximately two and a half blocks from the warehouse. Neither of the defendants had a weapon on his person." "Robert Bruce Papes, Anthony Rock and Glenn Hickman were indicted by the Grand Jury of Will County for the offenses of murder and burglary. After trial by jury the defendants Rock and Hickman were found guilty of the crimes of murder, burglary and criminal damage to property. Papes was found guilty of burglary and criminal damage to [p. 413] property but not guilty of murder. The defendants Hickman and Rock filed a motion to arrest the judgment of guilty of murder and burglary. This motion was partially granted by the trial court in that the judgment of guilty for the crime of murder was arrested. [Robert Bruce] Papes was placed on probation for a term of two years for the offense of burglary and as a term of probation was ordered to serve six months at the Illinois State Farm at Vandalia. The defendant [Anthony Bindy] Rock was sentenced by the trial court to a term of not less than one (1) year nor more than one (1) year and one (1) day in the penitentiary for the offense of burglary. The defendant [Glenn] Hickman was placed on probation for the offense of burglary for a period of two years and as a term of probation he was ordered to serve nine months in the Illinois State Farm at Vandalia." -- ILL 04/03/1970 (www.chicagotribune.com) "Joliet Cop Shot to Death in Gun Battle"
"A Joliet policeman was shot to death last night, apparently during a gun battle between police and burglars, but city officials declined to give details of the gun battle. Robert Broucek, Joliet city manager, who acted as a spokesman for the police department, released only a short statement identifying the dead policeman as William Loscheider, 41, of 1617 Mason Ave, Joliet. Loscheider was shot in the head during a gun battle between policemen and several persons believed to be burglarizing the Illinois Liquor and Wine company, 757 Broadway, Broucek said. However, he refused to say how the policeman was shot. Louis R. Bertaai, Will county state's attorney, refused to comment on the shooting. Broucek said police arrested four men after the shooting, but refused to identify them. He said they had not been charged early today." 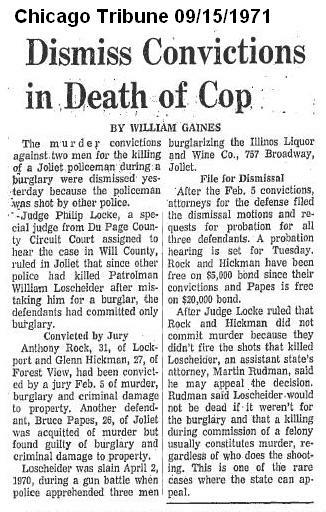 -- ILL 09/15/1971 (www.chicagotribune.com) "Dismiss Convictions in Death of Cop"
"The murder convictions against two men for the killing of a Joliet policeman during a burglary were dismissed yesterday because the policeman was shot by other police. Judge Phillip Locke, a special judge from Du Page County Circuit Court assigned to hear the case in Will County, ruled in Joliet that since other police had killed Patrolman William Loschelder after mistaking him for a burglar, the defendants had committed only burglary. Convicted by Jury. Anthony Rock, 31, of Lockport and Glenn Hickman, 27, of Forest View, had been convicted by a jury Feb. 5 of murder, burglary and criminal damage to property. Another defendant, Bruce Papes, 26, of Joliet was acquitttd of murder but found guilty of burglary and criminal damage to property. 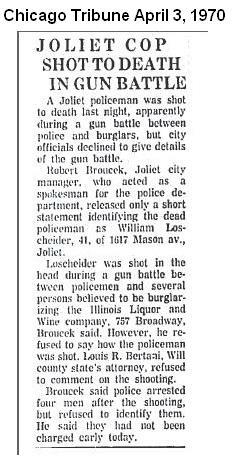 Loscheider was slain April 2, 1970, during a gun battle when police apprehended three men burglarizing the Illinois Liquor and Wine Co., 757 Broadway, Joliet. File for Dismissal. After the Feb. 5 conviction, attorneys for the defense filed for dismissal motions and requests for probation for all three defendants. A probation hearing is set for Tuesday. Rock and Hickman have been free on $5,000 bond since their convictions and Papes is free on $20,000 bond. After Judge Locke ruled that Rock and Hickman did not commit murder because they didn't fire the shots that killed Loscheider, an assistant state's attorney, Martin Rudman, said he may appeal the decision. Rudman said Loscheider would not be dead if it weren't for the burglary and that a killing during commission of a felony usually constitutes murder, regardless of who does the shooting. This is one of the rare cases where the state can appeal." 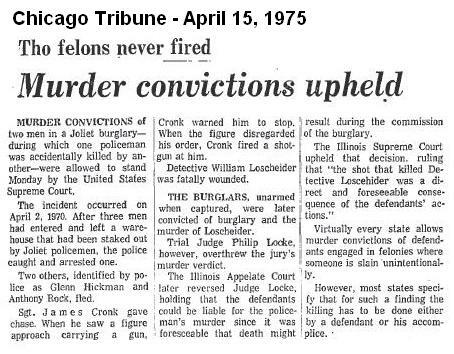 -- ILL 04/15/1975 (www.chicagotribune.com) "Murder Convictions Upheld"
"MURDER CONVICTIONS of two men in a Joliet burglary, during which one policeman was accidentally killed by another were allowed to stand Monday by the United States Supreme Court. The incident occurred on April 2, 1970. After three men had entered and left a warehouse that had been staked out my Joliet policemen, the police caught and arrested one. Two others, identifed by police as Glenn Hickman and Anthony Rock, fled. Sgt. James Cronk gave chase. When he saw a figure approach carrying a gun, Cronk warned him to stop. When the figure disregarded his order, Cronk fired a shotgun at him. 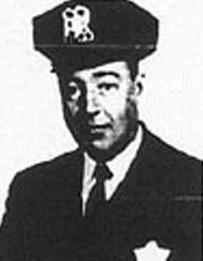 Detective William Loscheider was fatally wounded. THE BURGLARS, unarmed when captured, were later convicted of burglary and the murder of Loscheider. Trial Judge Philip Locke, however, overthrew the jury's murder verdict. The Illinois Appelate Court later reversed Judge Locke, holding that the defendants could be liable for the policeman's murder since it was a foreseeable that death might result during the comission of the burglary. The Illinois Supreme Court upheld that decision, ruling that "the shot that killed Detective Loscehider was a direct and forseeable consequence of the defendants' actions." Virtually every state allows murder convictions of defendants engaged in felonies where someone is slain unintentionally. However, most states specify that the such a finding the killing has to be done either by a defendant or his accomplice." Police Dept ILL 11/10/2007 (www.suntimes.com) "Cop once fired over claim of betrayal"
"Peterson began working as a Bolingbrook police officer in June 1977, according to court documents his lawyers filed in the appeal of his  firing. Peterson had previously been a military policeman and was responsible "from time to time . . . for the security of persons such as President Gerald Ford [and] the King of Siam," according to the court papers." November 10, 2007 Peterson working for M.A.N.S. ILL 11/10/2007 (www.suntimes.com) "Cop once fired over claim of betrayal"
"Beginning in 1978, Peterson was assigned to the Metropolitan Area Narcotics Squad, a joint operation of state, county and local officers from Will and Grundy counties." - "Two years after being hired [In 1977] at Bolingbrook, Peterson received a "police officer of the year" award, according to court documents." November 23, 2007 Drew Peterson Suspended June 1985 ILL 11/23/2007 (chicagosuburbannews) "Peterson internal investigation ends with resignation"
"In a prepared statement read by Mayor Roger Claar at the Village Board meeting Tuesday night [11/22/2007], the mayor acknowledged Drew Peterson was suspended in June 1985 and fired by the Fire and Police Board “for cause” on Aug. 12, 1985. “He was reinstated by order of the Will County Circuit Court on March 4, 1986,” Claar said." "We found out from different sources that the identity of an Illinois State Police officer was revealed to the [killer], by Mr. [Drew] Peterson" ILL 11/10/2007 (www.suntimes.com) "Cop once fired over claim of betrayal"
"Retired State Police Lt. Col. Ronald Janota hasn't spoken to Drew Peterson in more than a decade, but Peterson is a man he hasn't forgotten and will never forgive. In 1985, Janota was Peterson's boss at the Metropolitan Area Narcotics Squad -- working out of a "clandestine" office near Joliet, Janota told the Chicago Sun-Times this week." "Peterson, for reasons Janota said he has never been able to explain, allegedly sabotaged one of the squad's drug stings and gave the identity of an undercover narcotics agent to a convicted killer under investigation for dealing drugs, Janota said. "We found out from different sources that the identity of an Illinois State Police officer was revealed to the [killer], by Mr. Peterson," Janota said. " . . . We immediately notified the undercover officer that his life was in jeopardy." Added Janota, "Putting a fellow officer's life in jeopardy is unforgivable as far as I'm concerned." "More than 20 years ago , Drew Peterson was fired from the Bolingbrook Police Department after the village board of police and fire commissioners found him guilty of disobedience, conducting a self-assigned investigation, failure to report a bribe immediately and official misconduct. He had been indicted two months earlier on charges of official misconduct and failure to report a bribe. Peterson was working under the auspices of the Metropolitan Area Narcotics Squad at the time. Indictments alleged he solicited drugs in exchange for information about his agency. The charges later were dropped. Special prosecutor Raymond Bolden said at the time the charges were not provable. Drew Peterson won reinstatement with the department in March 1986. Judge Edwin Grabiec ruled police and fire commissioners lacked sufficient evidence to find Peterson guilty of the charges." "[Anthony Bindy] Rock was a central figure in an unsanctioned undercover investigation Peterson undertook while he was on loan from the Bolingbrook Police Department to the Metropolitan Area Narcotics Squad in 1985. That investigation led to Peterson's indictment on charges of official misconduct and failure to report a bribe. Peterson was fired following his indictment when the Bolingbrook Police and Fire Commission found him guilty of those charges, as well as disobedience and conducting a self-assigned investigation. On different occasions, two appellate court judges ruled Peterson's firing was excessive. The criminal charges against him were dropped and he got his job back." "Peterson's trouble from two decades ago started when he revealed to his supervisors that he'd embarked on a solo narcotics investigation of [Anthony Bindy] Rock. A state police undercover officer was already working on Rock, according to court documents, but Peterson went ahead with his probe and failed to tell his superiors until it hit a dead end. "You had better take your guns off. I have something to say that's real bad," Peterson allegedly told his supervisors at the time. And Peterson's former supervisor with the narcotics squad, retired state police Lt. Col. Ronald Janota accused Peterson of leaking the state agent's identity to Rock." November 23, 2007 Drew Peterson Fired 08/12/1985 ILL 11/23/2007 (chicagosuburbannews) "Peterson internal investigation ends with resignation"
- Drew Peterson fired Bolingbrook Police Department ILL 11/10/2007 (www.suntimes.com) "Cop once fired over claim of betrayal"
"But Peterson tells a far different story of the incident, which led to his temporary firing in 1985. And Peterson got his job back after he appealed the Bolingbrook Board of Police and Fire Commissioners' decision to fire him. In 1986, a Will County judge found Peterson's firing to be "excessive." November 23, 2007 Drew Peterson reinstated 03/04/1986 ILL 11/23/2007 (chicagosuburbannews) "Peterson internal investigation ends with resignation"
"Drew Peterson won reinstatement with the department in March 1986. Judge Edwin Grabiec ruled police and fire commissioners lacked sufficient evidence to find Peterson guilty of the charges." William Charnisky was Bolingbrook Police Chief in 1985 Drew Peterson reinstated Bolingbrook Police Department ILL 11/10/2007 (www.suntimes.com) "Cop once fired over claim of betrayal"
"Then-Bolingbrook Police Chief William Charnisky recommended Peterson be fired , and the village police and fire board terminated Peterson. But two separate appellate court judges on different occasions said the firing was excessive. Peterson's lawyers have said he was just trying to put a dangerous criminal behind bars, that he never did anything illegal and never divulged the identity of the state undercover agent. But Charnisky told the Sun-Times this week: "My opinion was that his conduct was unbecoming of an officer and he shouldn't have been reinstated." February 16, 2008 Grand Jury Subpoena Served ILL 02/16/2008 (www.suburbanchicagonews.com) "New subpoena served"
"A convicted cop killer reputed to have organized crime connections was subpoenaed to testify at the grand jury investigating the fate of Drew Peterson's last two wives. State police served Anthony "Bindy" Rock, 68, with his papers Friday, a source said. Contacted Friday night, Rock declined to comment. Rock was a central figure in an unsanctioned undercover investigation Peterson undertook while he was on loan from the Bolingbrook Police Department to the Metropolitan Area Narcotics Squad in 1985. That investigation led to Peterson's indictment on charges of official misconduct and failure to report a bribe." "Rock was a central figure in an unsanctioned undercover investigation [Drew] Peterson undertook while he was on loan from the Bolingbrook Police Department to the Metropolitan Area Narcotics Squad in 1985"
"He`s [Drew Peterson] got a lot of secrets about a lot of people, and he`s been able to fly under the radar because of that." 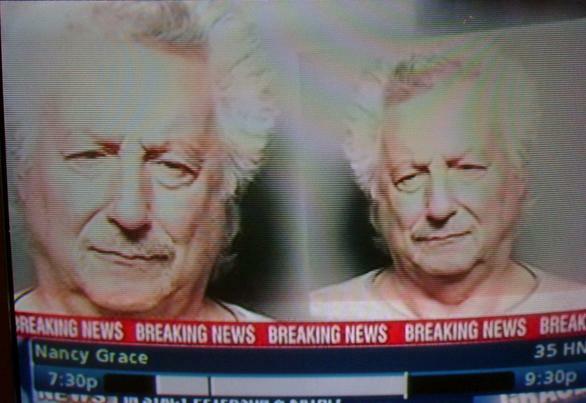 ILL 02/19/2008 (Nancy Grace) "Convicted Cop Killer to Testify to Drew Peterson Grand Jury"
MARY FRANCES BRAGIEL, WBBM NEWSRADIO 780: Well, basically, we`re trying to get more information on this Anthony Rock. I`ve talked to a few of my sources who know nothing about this guy. Even a spokesperson for the Chicago Crime Commission that deals with organized crime knows nothing about this guy. Now, Drew Peterson tells me that he dealt with him more than 25 years ago. He sold drugs to Drew Peterson during an undercover narcotics operation, and he was able to -- as part of that, Drew was able to get him arrested and charged and convicted. Drew believes that he`s got a book deal going, which is why the grand jury has subpoenaed him. It`s a book deal about Drew Peterson. - NANCY GRACE (HOST): Mary Frances, this guy, Anthony Rock, has quite a history. Now, you`re telling me that Drew Peterson put together a case that got this guy convicted on drugs. Is that the same case that was reversed on appeal? - MARY FRANCES BRAGIEL, WBBM NEWSRADIO 780: This was -- no. Back in 1970, he was convicted of killing a Joliet detective, but that was overturned. They realized it was friendly fire. Apparently, it was another detective that killed this detective. So then back in `85 is when Drew Peterson was involved with an undercover narcotics operation. Again, he got this Anthony Rock convicted 20 years, and that was overturned on appeal. I do want to mention that. LAUREN HOWARD, PSYCHOTHERAPIST: My sense about this guy is he`s [Drew Peterson] charming, he`s a player, he`s a mover, he`s a shaker. He`s got a lot of secrets about a lot of people, and he`s been able to fly under the radar because of that. And it looks to me like what they`re going to do is try to leak out some of the dirt on him that implicates him in bad behavior. "He [Drew Peterson] was actually fired over this because he was doing this unauthorized secret investigation" ILL 02/19/2008 (Nancy Grace) "Convicted Cop Killer to Testify to Drew Peterson Grand Jury"
NANCY GRACE (HOST):To Ed Miller with "America`s Most Wanted." What do you know, Ed?- ED MILLER, "AMERICA`S MOST WANTED": And he was involved in this so-called secret undercover investigation that Drew Peterson got himself into a lot of trouble -- let`s remind people about that. He was actually fired over this because he was doing this unauthorized secret investigation in which drugs were involved, et cetera, et cetera, with this reputed mobster, shall we say. So again, on appeal, Peterson gets reinstated, but there`s always been this dark cloud over his head because of that incident. So what I believe is going on is police are leaving no stone unturned. They`re going back and looking at every single person that Peterson has some sort of involvement in. And I believe it`s because of his arrogance. In other words, he has angered police to such an extent that they are bending over backwards, looking for clues. And I think that is why they`re going after this guy Rock. "But as a narcotics officer back in the `80s, they were kind of loose canons, so to speak. He [Drew Peterson] was independent in running his investigation, they found a little bit too independent" ILL 02/19/2008 (Nancy Grace) "Convicted Cop Killer to Testify to Drew Peterson Grand Jury"
NANCY GRACE (HOST): Why was your client, Drew Peterson, now the chief suspect in his wife`s believed death -- why was he in a secret investigation, a drug investigation that even his own superiors knew nothing about? - JOEL BRODSKY: Well, I know that the appellate -- two appellate court judges, in reinstating Drew to his job, found that he didn`t do anything that serious. But as a narcotics officer back in the `80s, they were kind of loose canons, so to speak. He was independent in running his investigation, they found a little bit too independent. But it did net a very serious criminal, a cop killer, selling large amounts of amphetamines. And he did put him in jail for a while until it was reversed by the appellate court. NANCY GRACE: Interesting. Now, back to my original question that I didn`t quite hear an answer to, Mr. Brodsky. That would be, why was your client conducting an extensive drug investigation as an undercover narcotics agent dealing with dopers that even his own bosses didn`t know about? Why? - JOEL BRODSKY: Well, according to Drew, that was par for the course. They were pretty much independent contractors. They could conduct their investigations as they saw fit. NANCY GRACE: You know, after all my years as a narcotics prosecutor, I`ve never heard of that. - JOEL BRODSKY: They were very loosely manned. The metropolitan area narcotics squad was very loosely governed by the multiple jurisdictions that were covered, and the officers could almost, to some extent, start and pursue their own investigations. "This was an unsanctioned undercover investigation. And there`s no room for freelancing, especially when you`re dealing with drug dealers" ILL 02/19/2008 (Nancy Grace) "Convicted Cop Killer to Testify to Drew Peterson Grand Jury"
NANCY GRACE (HOST):: Is that why they fired him? - JOEL BRODSKY: No. They had a report -- they found that he didn`t report enough and frequently enough, and that`s why he was suspended for a period of time without pay. But all the appellate -- two appellate court judges found that he didn`t do anything that serious enough to warrant him being fired. So it wasn`t all that serious. MIKE BROOKS, FORMER D.C. POLICE, CNN LAW ENFORCEMENT ANALYST:: Well, Nancy, he was part of a task force, similar to I was for six years with the FBI. He was what -- I guess it sounds like he was what you call freelancing. Now, even if you find someone as a result of another case you`re working on and you target this person, you know, you still let your supervisors, whoever it is -- the DEA, someone with Chicago police, whoever was running that task force, they need to know what was going on. This was an unsanctioned undercover investigation. And there`s no room for freelancing, especially when you`re dealing with drug dealers. I mean, you know, I don`t understand -- you know, he was let go for disobedience and conducting a self-assigned investigation. That sounds like freelancing to me. Is it enough to lose your job over? Absolutely. But he didn`t. Two judges said, You can have it back. "I don`t think there`s any reason why it`s been six months before he`s [Rock] been brought before the grand jury all of a sudden" ILL 02/19/2008 (Nancy Grace) "Convicted Cop Killer to Testify to Drew Peterson Grand Jury"
NANCY GRACE (HOST): What does this guy, a reputed mobster, dope dealer, convicted cop killer -- what does he know that is so much about Drew Peterson, he can literally write a book? - RAY GIUDICE, DEFENSE ATTORNEY: Well, I don`t think he knows much. I don`t think there`s any reason why it`s been six months before he`s been brought before the grand jury all of a sudden. He`s not going to be subjected to cross- examination by Mr. Brodsky. I think he probably is concocting some story. And I`ll bet there`s a whole lot of defendants that Mr. Peterson, when he was an officer, put in jail that would love to get a free day in front of the grand jury and some coffee and some doughnuts and come up with some kind of story. - SUSAN MOSS, FAMILY LAW ATTORNEY: Oh, you`ve got to be kidding me! Apparently, this guy has enough to say that the prosecutors put him before the grand jury. This guy may come up with who knows, but it really might be interesting. And God willing, it`s the clue that leads to the solving of this mystery. “I always liked Bindy, just because he was a character,” he said. “He was a known criminal, but he had a personality that made him fun to work.” "[John] Schrock [Bindy's Attorney] did accuse Peterson of “shaking Bindy down for money” in 1985"
Immunity from prosecution!" ILL 02/21/2008 (suburbanchicagonews.com) "Peterson's 3rd wife's death ruled a homicide"
"Also on Thursday [02/21/2008], convicted cop killer Anthony “Bindy” Rock appeared before that grand jury, a pair of sources said. Confronted at the office of his attorney, John Schrock, neither he nor his lawyer would confirm or deny that Rock testified.The sources said the 68-year-old Rock, who is reputed to have organized crime connections, received immunity from prosecution in exchange for his testimony. Again, neither man would confirm this was the case. "Schrock did accuse Peterson of “shaking Bindy down for money” in 1985, when Peterson was an undercover officer with the Metropolitan Area Narcotics Squad. Peterson dismissed the allegation, saying, “It doesn’t matter. Whatever he says don’t mean nothing.” Peterson did express his appreciation for Rock. “I always liked Bindy, just because he was a character,” he said. “He was a known criminal, but he had a personality that made him fun to work." February 24, 2008 Organized Crime Connection? ILL 02/24/2008 "Organized Crime Connection in the Drew Peterson Case?" "A convicted cop killer reputed to have organized crime connections was subpoenaed to testify at the grand jury investigating the fate of Drew Peterson's last two wives. State police served Anthony "Bindy" Rock, 68, with his papers Friday (the 15th), a source said." - "The spokesman for the state's attorney's office, Charles B. Pelkie, said he could not comment on why or even if Rock was subpoenaed. Peterson himself could not understand what prosecutors wanted with Rock, who he had arrested once before the unauthorized investigation in 1985. "All he knows is, I tried to buy dope from him a couple times. I put him away for 20 years," Peterson said. "He got out on appeal."